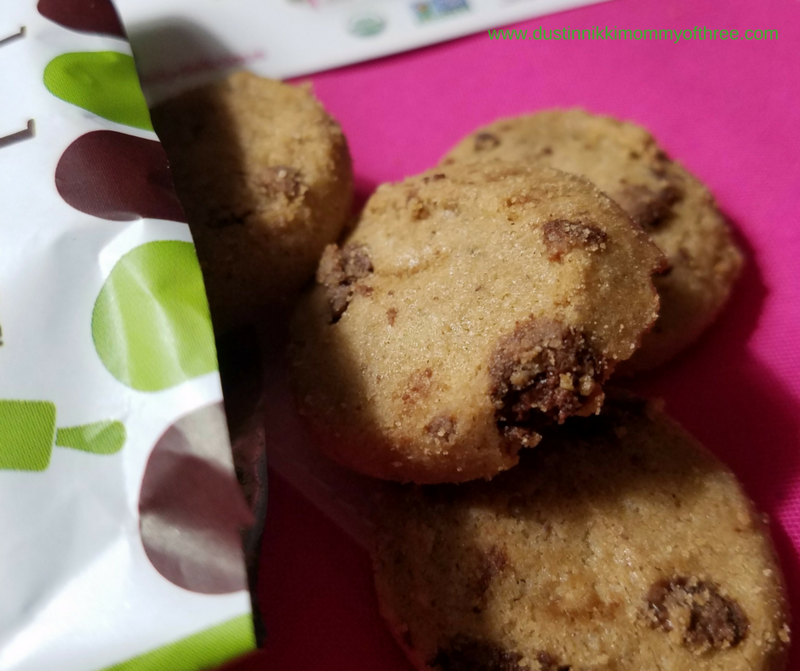 Another awesome sample that I received in my most recent Daily Goodie Box is GinnyBakes Organics Mini Chocolate Chip Cookies. If you don’t know what Daily Goodie Box is, see the bottom of this review for more details and information. 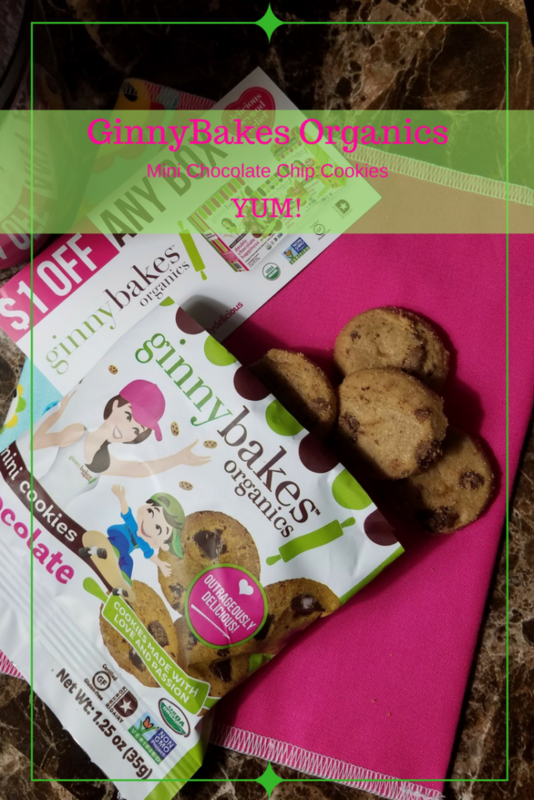 GinnyBakes Organics Mini Cookies comes in a variety of flavors. There’s the Chocolate Chip cookies that I received, there’s also Butter Crisp, Double Chocolate and Coconut Oatmeal Bliss. 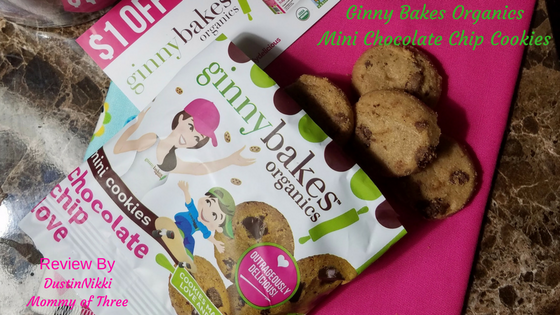 GinnyBakes Organic Mini Cookies are made with all organic ingredients which I love other than the fact that they are really good. They are made in the USA, are non-GMO and are also Gluten Free! These mini cookies are crunchy and not soft. They have a really great taste too. I normally like them thin if I am eating crunchy cookies but these aren’t exactly thin. But they are easy to chew even though they are pretty crunchy. They soften and kind of “melt” in your mouth. I love the texture. They are sweet and I absolutely love that the chocolate chips are dark chocolate and not milk chocolate. My kids love them too. I picked up a couple boxes at my local Kroger store and use them in my kiddos school lunches. 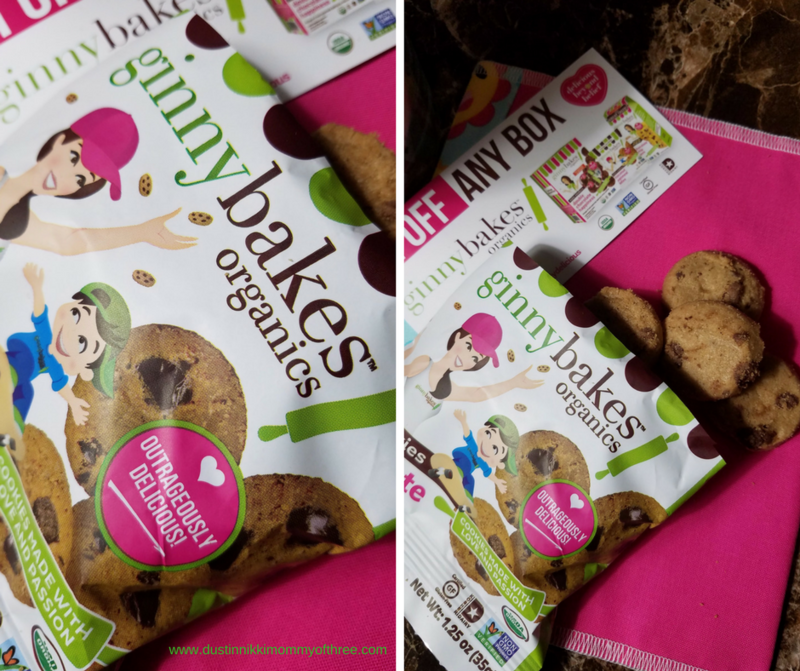 GinnyBakes Organic Mini Cookies are definitely great. I would recommend them for sure. I love the mini size cookies and the thickness. The crunchiness is pretty awesome, the texture is really great and the taste of them is really good. Yum! Buy Them: You can buy them online on their website or you can use their store locator to find a store near you. They are available at my local Kroger store and you can buy a box of them with 6 packs of cookies in each box. They retail for around $5-$6 per box. About Daily Goodie Box – DGB is a sampling program that is free to join. When you sign up, you can get opportunities to receive free sample boxes. These sample boxes are filled with very generous size samples of 8 to 10 different products. Sometimes more. And sometimes there are a couple full size products inside them as well. You aren’t guaranteed a box every month but they also give away a bunch of boxes on their social media accounts every day. If you are selected for a box, all you have to do is log into your Daily Goodie Box account and leave reviews/feedback for all the products you tried to stay eligible for future boxes. That’s it! A blog is not a requirement. For more of my DGB posts and reviews, you can check them out HERE.